1. The people are friendly and welcoming. Case in point - I've been invited to share multiples asados with people who take care of all the food, barbeque, drinks, and then tell me "You have to eat more." If that's not love, I don't know what is. 6. They eat breakfast, lunch, an afternoon snack (like "once" - bread, ham, cheese) AND a late dinner - now that's my style. 4 meals. 12. Oh wait....did I mention the meat and the wine??? This list is just the tip of the iceberg. But obviously I'm obsessed, so I'll continue adding to it as I learn and discover more. A few years ago I went through a couple rough months - I felt helpless. I had moved to Atlanta, but couldn't find a job, missed my family, lost some friendships I treasured, and didn't feel like I was making any progress in my life. My friend told me I was ridiculous. At first I didn't appreciate his lack of sympathy (woe was me), but when he told me to make a list of all the things I was thankful for, I obliged. The paper was quickly filled with my many blessings. I still have that paper tucked away, and pull it out from time to time when I'm feeling sad or "down and out." I realized when I took the time to recognize what I was happy about, it made me more aware of the good things instead of dwelling on the "bad." My mood changed, I was more appreciative, and felt like the things that weren't going my way really didn't matter as much as the things that did. Happy Valentine's Day everybody! It just so happens that on this day of love, I left one of the countries that I love. It's a bittersweet feeling - I think my journey is truly beginning, now that I am away from the comfort of "home" and the familiarity of friends and family. But "on to the next one" as they say (or maybe that's just Jay-Z). 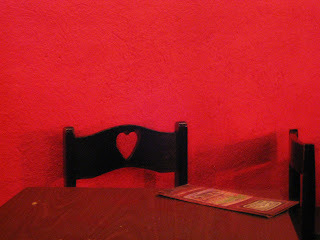 I saw this cute chair at the La Piedra Feliz - how appropriate! As I say "goodbye" to Chile, I'll share with you their passion for love. My Chilean friend summed it up best (when referencing his last relationship) as he sighed and admitted, “I’m in love with love.” What an endearing, vulnerable, and downright adorable statement. 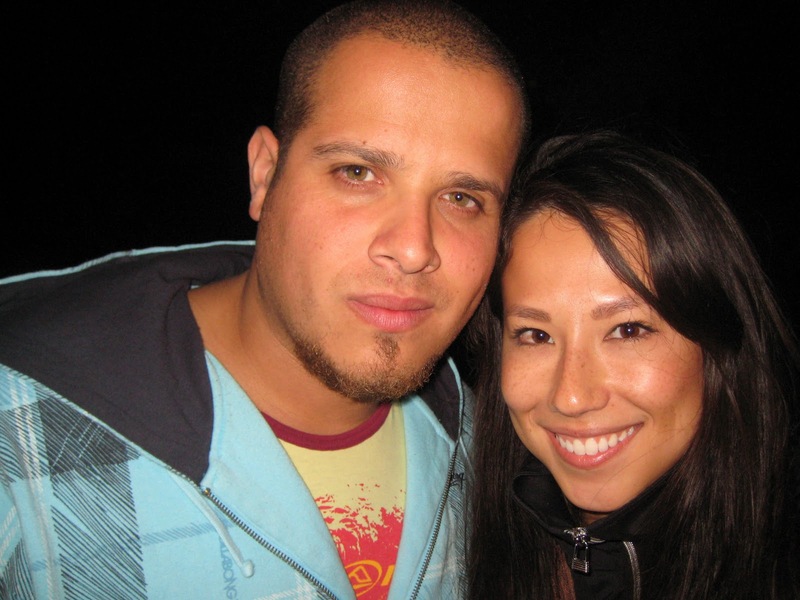 In Chile love is nothing to be shunned or shied away from. As an American who isn’t fond of PDA (ewwww) I didn't like seeing people making out in parks, on the bus, at parties, on escalators, in restaurants....okay you get the picture. But eventually I got used to it – people love to touch, show affection, and be close to each other. A perfect example of this closeness is how people greet each other. There aren't any distant, stiff, professional handshakes. In Chile people greet each other with one kiss on the right cheek. Males and females, females and females, and sometimes males and males too. If you go to an asado and there are 16 people, you best be expecting to kiss 16 cheeks, regardless of if you know them or not. Now this is normal to me, but I remember when my family came to visit me 5 years ago. My then 16 year old brother thought it was bizarre and I couldn’t help but smirk every time a Chilean girl (or woman, for that matter) would come in for a kiss on the cheek. He would get all red and nervous looking. J He had that awkward "What do I do now?" look about him. Cute. Innocent. And a reflection of how our society (or at least the one which I come from) depresses physical contact. After living in Chile I embraced it - I felt like it was a sign of welcoming and warmth - one simple gesture which I will miss so much. I always wonder why single people don't like Valentine's day. I think it has to do with jealousy or the lack of "someone special" to spend the day with. If you are single, I have a request of you today (not a thought - a request)....that you may be happy. I might not have that ONE special person in my life, but I can give thanks because I have LOTS of special people in my life. To me Valentine's Day is a day to celebrate the love in your life no matter who it comes from - your husband/wife, boyfriend/girlfriend, family, friends, or anybody else that brings you joy. My mouth is watering just thinking about the deliciiiiousss “marchas parmesanas” we had for lunch the other day. Marchas are a type of clam, found along the Peruvian and Chilean coasts (or so the internet tells me). My host mom’s boyfriend put his own spin on the Chilean dish and made it with butter (obviously…because it’s a Chilean dish), lemon juice, salt (even more obvious), and topped it off with a bit of Reggiano cheese. Then he threw it in the oven for 2 minutes. I slurped it off the shell and settled back into my “happy place”. Later that night my sister, Meli, and I went out. I have to share this (nearly) unedited video of a bunch of Chileans, some friends and some not, who gathered outside the bar after closing to share some singing and dancing. I LOVE this. Usually in Seattle after bars close there are fights – when would I ever see a random group break out in song and dance??! Sand sculptures of my favorite movie...Finding Nemo! We are raised to believe we are “unique” and “special,” but sometimes it’s a good thing to be a “blender.” For instance, right now I don’t want to stick out like a sore thumb. I want to be part of the crowd. This example is obviously based on appearance, but under the surface I know it applies to other parts of my life. So when in your life does it benefit you to “blend,” and when does it benefit you to be easily identifiable? Feeling the earth shake when you're alone on the 7th floor of an apartment building is not ideal, especially when Chile had a devastating 8.8 earthquake almost one year ago - February 27, 2010. This was not originally the type of "groove" I intended to write about, but it SCARED THE CRAP OUT OF ME so I decided to share. In Chile "temblores" or small earthquakes are a common occurrence. When I lived here 5 years ago there were about 2 per month and after one woke me up in the middle of the night they started to terrify me because nobody knew when it would be a bad one. For me, hunger strikes early and it strikes often. 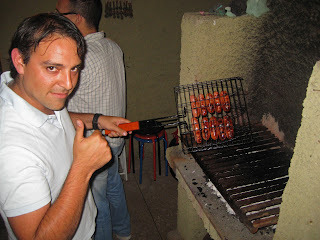 The other day I went to an asado (barbeque). I’m now accustomed to showing up at 11 PM and waiting until about 1 AM to start grilling. At first this killed me because I thought there would be a giant half cow awaiting me on a platter (sorry for you vegetarians – I’m a carnivore). Instead there is a big group of people sitting, talking, and enjoying a Piscola (Chilean liquor with Coke) while somebody grills sausages and passes them around like appetizers. 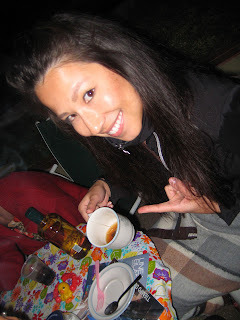 My friend Michi thought there was something wrong with me since I was sticking to tea… looks like I’m known as a partier no matter what continent I’m on. Despite the fun, I stuck to my 3 drink max (a promise I made to my friends that I wouldn’t over-imbibe while traveling). Look how responsible I’ve become! Juan and me after "Tomanji"
After Tomanji we left for the club at 2 AM and got home about 5 AM. (Side note: hunger struck again and I killed two empanadas before going to bed – no wonder I gained so much weight last time I was here). Below is a snapshot of some different nightlife – although the hours of “carrete” might not change, the type of dancing and music varies quite a bit. 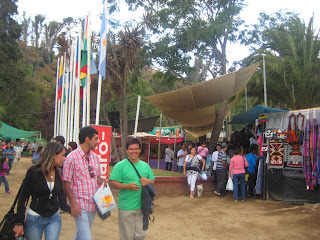 Last but not least, I went to the Feria de Artesania yesterday. It’s like a flea market – and it was in a woodsy part of the city. Suddenly the sun disappeared and thunder and lightning broke out. I seemed to be the only one who thought the tall metal poles and trees were an issue?! I started walking out of the Feria and it started pouring rain and then all of a sudden everybody else started freaking out and trying to hide under trees or flee (haha…flee the flea market). Maybe it’s my Seattle roots – but the rain seemed like the lesser of the two evils in my mind. So there we have it – during my stay in Chile we’ve had a thunder storm, the power has gone out (in 9 of 15 regions of the country for about an hour), and we’ve had an earthquake. Although I don’t appreciate the natural disasters (okay…they’re not disasters but they’re also not pleasant), I understand it’s a part of life here. Much like the late night parties. It’s a way of life and even when I’m tired and ready to go home I remind myself that if I go to sleep it’s one less experience that I’ll have. Too frequently in Seattle I go through the motions or routine without thinking or feeling. This journey is about stepping outside my comfort zone – being alert, keeping my senses alive and soaking up everything around me. It’s about “feeling” my life, and not just letting it pass me by. So I'll leave you with this thought – without any drastic changes, what can you do in your life to experience more? To “coast” less? To feel and think and experience your life rather than let it pass you by? Yesterday afternoon I was blessed with the sweet sound of tango music and the serenity of being outside the city. Not to mention a beautiful 80 degree day and a delicious lunch of Pastel de choclo (like a corn pie). Man, my life is rough. It’s a bit sweet so it caramelizes perfectly on top (love the mix of crunchy and chewy!) and it is filled with corn, meat, chicken, half a hard-boiled egg and one olive. I have no idea why there are so many Chilean dishes with half a hard-boiled egg and one olive inside them – but since I love them both I just go with it. This is another traditional Chilean dish and if you want to try it, I did find a recipe in English - http://www.nuevoanden.com/recetas/recpastel.html. A friend of the family, Mario, took my sister Karen and me to Los Andes to see the tomb of Santa Teresa de los Andes and then we ate at this old Monastery that was built in 1819. (Notice the inscription above the door). I was terrified of the mannequins when we took a tour after lunch because I swore there would be a real person under one of those cloaks and somebody would grab my hand or blink at me. Thus, I refused to take a picture with one. It was dark and eerie there – and yes, I’m still afraid of the dark. Don’t make fun. Over lunch we talked about the difference between Chilean meals and eating in the U.S. As I mentioned in ‘Comfort at “Home,”’ lunch is the biggest meal of the day here. People come home from work, kids come home from school, and families usually eat together and then return to their daily activities. The origins of “once” are disputed. But the most popular Chilean lore is based around an alcoholic beverage called aguardiente – because the word has 11 letters. Some say it was used during a prohibition and some say men used “tomando once” so that women wouldn’t know they were referring to an alcoholic beverage. I prefer the latter as if “us females” are so stupid we wouldn’t know when “you males” come home inebriated. 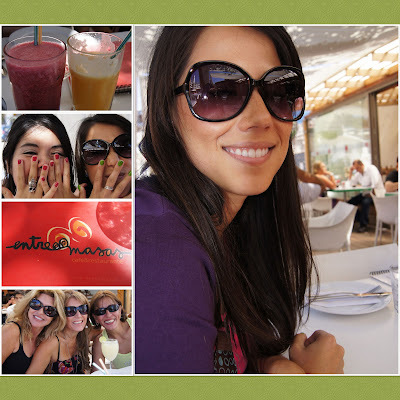 Or perhaps we might be “tomando once” ourselves! Hah! Either way, it has now turned into conversing over tea, coffee, sweets, pan (bread), cheese, ham, and perhaps a Pisco Sour (Chilean drink). It’s always amusing to me what I learn about peoples’ relationships and families over this “meal.” Just last night my host mom was accounting how her “boyfriend/not so sure if he’s her boyfriend/now he’s not her boyfriend” stopped calling all of a sudden. And as soon as she moved on with her life he started calling and calling again. Hmmmm…sounds like the plight of a single woman if you ask me. Although I dearly appreciate “once”, and quite enjoy having a feast for lunch, my stomach still longs for a sufficient meal at night. 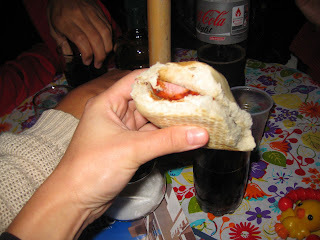 So the other day I wondered down the road in search for my faavvvorite Chilean food – fried empanadas. J And as my dad says, “it’s better to be lucky than good” because I had forgotten where my favorite restaurant was but happened to run into it! Now, if you haven’t been to Chile, let me tell you that you haven’t ever had a good empanada. You can fight and argue all you want but I’m putting my foot down in saying Chile has the BEST empanadas in the world. So much so that I’m bold enough to look like a crazy foreigner eating by herself (unheard of here). Topped off with another empanada de camaron (shrimp) y queso (cheese). My thought for you for today – food truly makes me happy. Like a happy I can’t describe. So, I really want to know when I ask you this question – what is your favorite meal you’ve ever had? And where in the world was it? And if I’m going there you have to give me the address!! Maria is our “nanny” and she comes about 3 times a week to help cook and clean. It’s very common to have help around the house in Chile and she has worked with this family for nearly 20 years. 20 YEARS! Also available on YouTube in higher quality video. 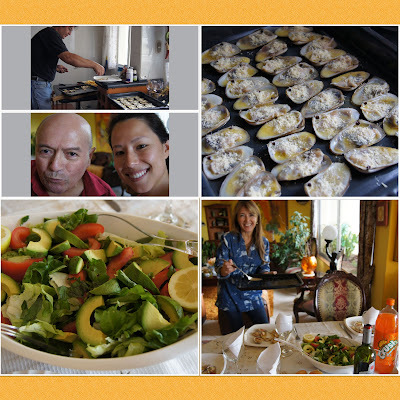 The beauty of cooking in Chile is the lack of recipe. It’s like they have a feeling, a notion, a sixth sense about what’s “right” in cooking. A dash of this, a little of that and wa-lah! Magic! Some delicious, aromatic wonder always appears. If you’re adventurous and feel like you have the “magic touch” then try out my recipe for Zappallos Italianos Rellenos. I’ll give you the list of ingredients but leave you to taste test your way through the measurements. My one recommendation – go with your gut! This type of cooking is just like life – there’s no “right” or “wrong” way. As much as I sometimes hope there is one answer, there never is. Just like a meal without a recipe, sometimes you have to take your best shot, and hope that everything will come out okay. I’ll leave you with this thought…no matter what decision you’re facing – whether it be monumental, or merely if you should go out for dinner tonight or stay home – make the choice, and then make it the right choice. And to top it off…I’ll leave you with my all-time favorite quote. 1. Boil water and submerge the zucchini in the water. Let it boil until it’s soft on the outside and the skin can be easily punctured when poked with a knife. When it’s ready, remove the zucchini from the water and let it cool a bit in a strainer or bowl. 2. Chop finely the onion, cilantro and garlic. Start it simmering in a wok or large pan. 3. Soak the dried soy meat in hot water until it becomes clear. (Or cook the meat just a bit). 4. Add the meat or soy meat to the wok and stir. 5. Slice open each zucchini down the middle (hotdog style not hamburger – throw back to kindergarten!). 6. Gut the soft part of the zucchini and put it in a bowl. Lay the zucchini skin on a greased baking sheet, skin side down. 7. Stir in the “zucchini guts” from the bowl into the wok. 8. And fine bread crumbs (through a strainer is best) to the wok and stir. 9. Add eggs to the wok and stir. 10. Once the mixture is cooked, fill the zucchini skins with the mixture and top with cheese. 11. Throw it in the oven on a lower temperature for about 15 minutes. See my video for glimpses of the techniques used. And voila! How did it turn out?? !